About 150 guest principals shadowed Long Beach Unified School District principals last week during the annual Principal for a Day event. Afterward, the guest principals, other educators and community leaders gathered for a debriefing at the Beverly O’Neill/Center Theater. This year’s debriefing doubled as a discussion on the State of Early Childhood Education. Participants in the debriefing included California State Assemblyman Patrick O’Donnell; Long Beach Mayor Robert Garcia; Michael Burke, vice president, Buffett Early Childhood Fund; Sonia Campos-Rivera, director of Education and Public Affairs, Los Angeles Area Chamber of Commerce; Maria Harris, principal, Educare Los Angeles at Long Beach; Lou Anne Bynum, executive vice president, College Advancement and Economic Development, Long Beach City College; Claudia Sosa-Valderama, director of LBUSD Head Start; and Long Beach Police Chief Robert Luna. Assemblyman O’Donnell had just spent the morning at Stanford Middle School, where his children attend. “I have a sixth grader and an eighth grader at Stanford Middle School, and I can’t tell you how proud I am of that institution,” said O’Donnell. He encouraged the audience to advocate for further support of early childhood education in California’s draft budget. The “State of Early Childhood Education” discussion included a description of the Educare of Los Angeles in Long Beach project planned at LBUSD’s Barton Elementary School. The new Educare facility will be located on 2.6 acres of the existing Barton Elementary School campus, and it will serve nearly 200 infant, toddler and preschool children. The research-based program will serve children from birth to five years old. The Educare project fits into The Long Beach College Promise initiative, a partnership among the school district, Long Beach City College, Cal State Long Beach and the City of Long Beach. The Promise initiative includes an emphasis on early childhood education. The Educare project will consist of a new 32,000 square-foot facility with a two-story administration and support services building and three one-story classroom buildings surrounding a central outdoor educational and playground space. Construction is set to begin this month and continue through March 2018, though some students will start in fall of this year. The project began with an anonymous donation of $7 million, and efforts to raise matching funds are well under way. LBUSD is partnering with the national Educare organization and other agencies on the project. Learn more about the Educare organization at educareschools.org. HARMONIOUS – Students from the Harmony Project perform at the annual Principal for a Day debriefing. 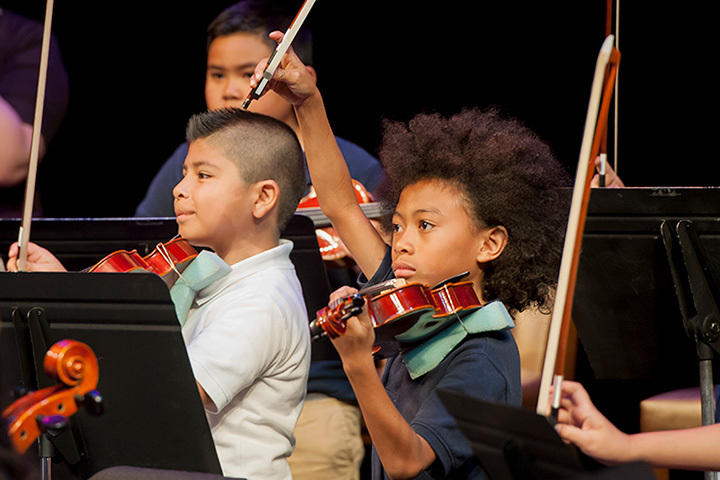 The school district began partnering with the nonprofit Harmony Project last school year, allowing students to learn violin, viola and cello as early as second grade.